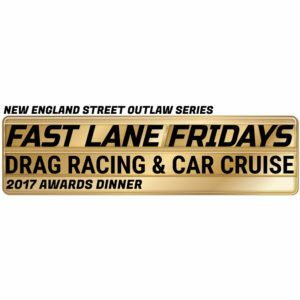 Gales Ferry, CT (October 18, 2017) – The New England Street Outlaw Series will crown its New London-Waterford Speedbowl Fast Lane Fridays Champions on Friday, December 1st at the Holiday Inn in Norwich, CT. Following an exciting 14 point event schedule it was Warren Wright in the Outlaw Class, Adam Lewis in the Street Class and Jon Tisdale in the Bike Class earning the title of 2017 Champion in their respective classes. In addition to the champions the series will honor the Top-15 in the Outlaw Class, Top-10 in the Street Class and Top-15 in the Bike Class as well as specialty awards. Warren Wright of Salem, CT, who is now a 4-time track champion (2011, 2015, 2016, and 2017) in the Outlaw Class, earned his impressive third straight title by again running consistently week in and week out. The change from previous years was he retired his famous purple and white Chevy Malibu from Fast Lane Fridays following the 2016 season and instead chose to run his 1969 Chevy Chevelle. Wright would earn a total of five Eliminator victories in route to his fourth championship. Adam Lewis of Stonington, CT had a remarkable 2017 season in the Street Class. Lewis at the helm of his 2014 GMC Sierra was able to win a Fast Lane Fridays high of six Eliminator victories. He would go on to find victory lane during the first five consecutive weeks of racing and would make it to nine Finale Rounds during the season. Lewis started racing at Fast Lane Fridays in 2014 and was also named Rookie of the Year. He has previously finished fourth in points in 2014 and 2015 and was able to improve to a third place standings finish in 2016; this will be Adams first Fast Lane Fridays Championship. Jon Tisdale of claimed his first Bike Class Championship this season after multiple seasons of running a partial schedule. Tisdale is no stranger to drag racing; he has been competing for over 37 years at tracks all over the country, primarily Lebanon Valley Drag Way in upstate New York. After a slow start during the first few weeks of the season Tisdale would find his grove and post impressive, consistent reaction times during the course of July and August that lead him to a class high five wins. The festivities will take place in the main ballroom at Holiday Inn in Norwich, CT (10 Laura Boulevard, Norwich, CT 06360) on Friday, December 1st starting at 6pm with a cocktail hour followed by a buffet dinner and awards presentations at 7pm and music and desserts until 10pm. Tickets are $35 per person and must be purchased in advance. Complete event information can be found at NEStreetOutlaws.com. Tickets are now on sale now for the 2017 Awards Dinner. You may purchase online at NEStreetOutlaws.com and also read complete information on the event. You must purchase tickets in advance; no tickets will be sold at the door. In an effort to keep costs down, awards will only be ordered for those recipients who have purchased a ticket by Monday, 11/27/2017. Tickets may be purchased until November 29, 2017. For more information and announcements forthcoming please be sure to visit www.NEStreetOutlaws.com and follow New England Street Outlaws on Facebook. The New England Street Outlaw Series is based in New England and features exciting spectator drag racing events at various regional venues. From asphalt to dirt, from 100 feet to 1/8 mile strip the NESOS can handle any size venue with its temporary electronic track system complete with sensors and a professional drag racing tree. We bring the drag racing to you! For more information or to setup a public event or book private events please visit www.NEStreetOutlaws.com or email Info@NEStreetOutlaws.com. The New London-Waterford Speedbowl opened on April 15, 1951 as a 1/3 mile crushed blue stone oval race track. After 3 weeks of operation, the dust created during green flag segments of racing became a nuisance to spectators. The track closed for about a month and re-opened as an asphalt oval, which it remains today. Currently the New London–Waterford Speedbowl operates 3-nights a week from May thru October with affordable Wild ‘n Wacky Wednesday action, Fast Lane Fridays Drag Racing & Car Cruise and Saturday Night Short Track excitement. For more information visit www.SpeedbowlCT.com.